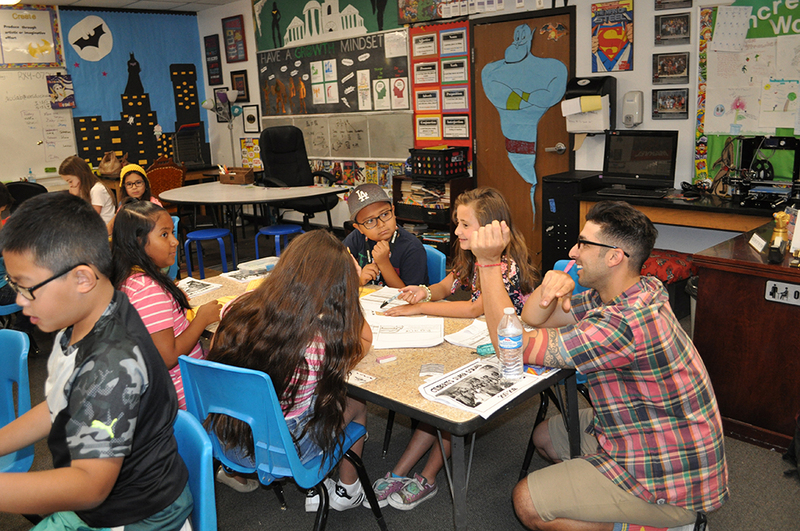 How will the federal Every Students Succeeds Act build stronger schools in Arizona? Here is what you need to know. Congress approved the Every Student Succeeds Act in late 2015. It replaces the No Child Left Behind Act of 2001 and reauthorizes the Elementary and Secondary Education Act of 1965. Lawmaker’s intent with ESSA was to increase state and local control in setting education policy and reduce the federal government’s role by requiring each state to develop its own education plan to take effect in 2017-18. 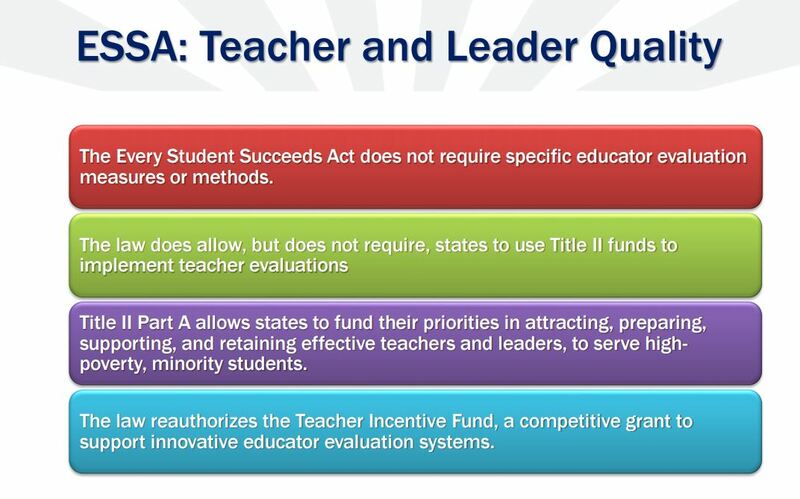 Arizona’s plan will focus on areas ESSA requires state authority over: accountability and school supports, assessments and standards, teacher and leader evaluation/development, and student health and safety, said Leila Williams, Arizona Department of Education associate superintendent for high quality assessments, accountability, adult education and school improvement. 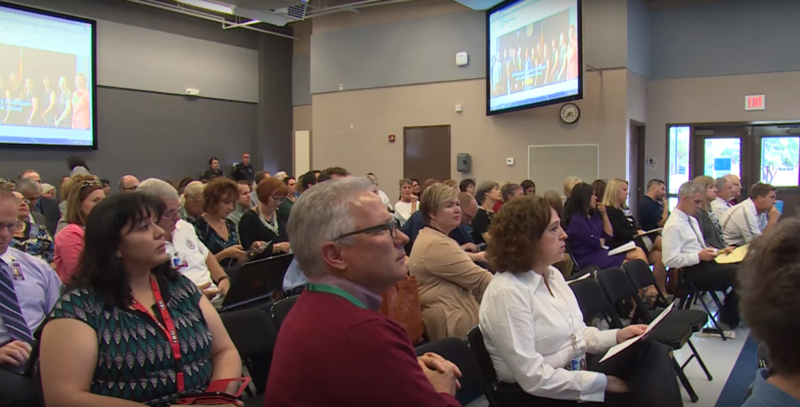 Since ESSA was made law, Arizona Department of Education officials have begun meeting with education leaders, organizations and the public around the state to talk about ESSA and seek public input on what should be a part of the state’s plan to improve the quality of education in Arizona. “It is really an opportunity to provide feedback and really let us know what you would like to see done differently,” Williams said during a presentation at a June 10 conference in Tucson organized by Arizona School Boards Association. Feedback can be submitted through a survey at www.azed.gov/essa, by email at ESSAInbox@azed.gov and on Facebook or Twitter using the hashtag #ESSAinAZ. People can also share their thoughts on ESSA with Arizona Superintendent of Public Instruction Diane Douglas, Arizona Superintendent of Public Instruction at her upcoming We Are Listening Tour events, July 19 in Pinetop-Lakeside and July 21 in Payson. More events are planned through the fall and a schedule is available at www.azed.gov/weheardyou. The biggest change from NCLB to ESSA is that instead of the federal government creating goals for all schools to meet for students’ proficiency, “the state is now given the opportunity to write their own goals and to choose how they want their accountability system to look based on the needs of their students,” said Nancy Konitzer, ADE deputy associate superintendent for Title I. In NCLB, attendance was an indicator of student success, but most schools met the 95 percent target, so ESSA asks states “to choose something that is more differentiating,” Konitzer said. 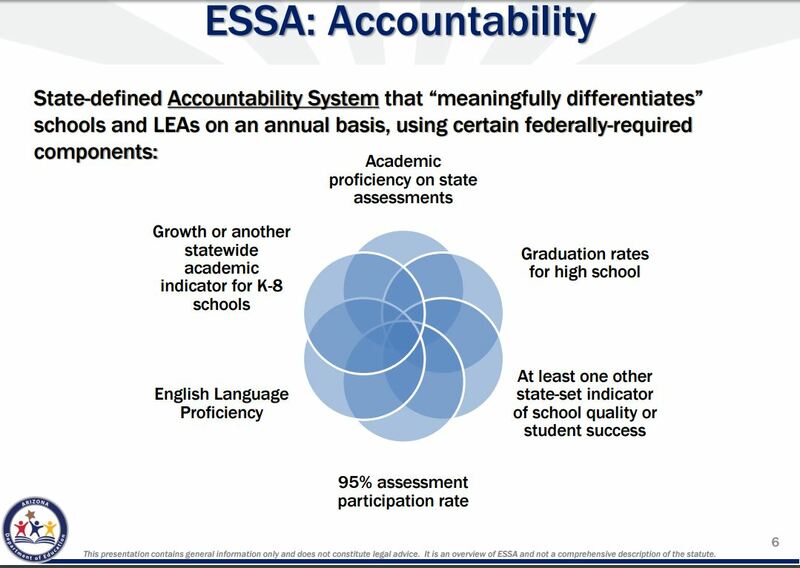 Another change is that in ESSA, English Language Proficiency is no longer a separate accountability piece instead English Language Learners are part of the regular accountability system, evaluation of a school and subgroup performance, Konitzer said. 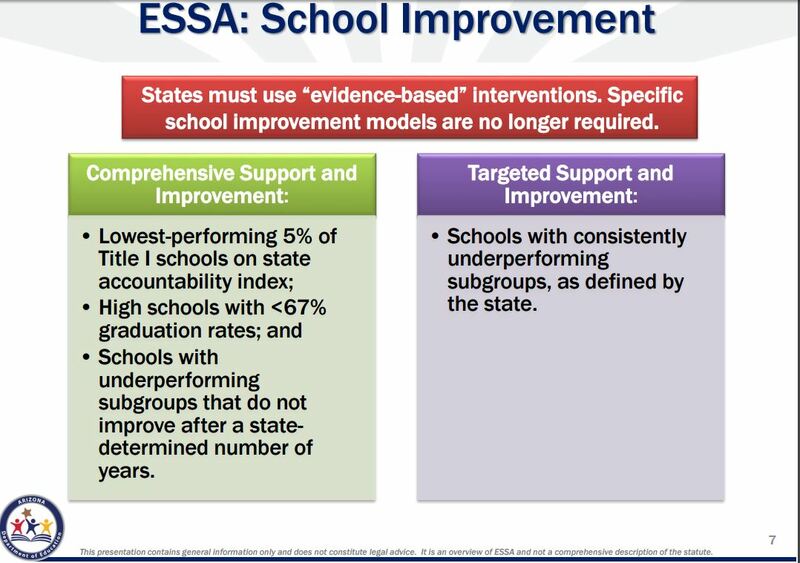 If schools do not meet state-set academic performance goals for students by a state determined time, they will be put in one of two school improvement categories under ESSA, Konitzer said. Three major changes are related to the state assessment, Williams said. 1) Students taking Algebra I in high school can take the high school math assessment instead of the eighth-grade math assessment. 2) Students will be tested at least once in elementary, middle and high school. 3) No more than 1 percent of students statewide can take an alternate assessment. The new flexibility in choosing assessments is important, because the test “was meant to measure and look at how a student is doing and determine how we can best help them improve their skills and their knowledge” not evaluate teachers or determine schools’ success, Douglas said. 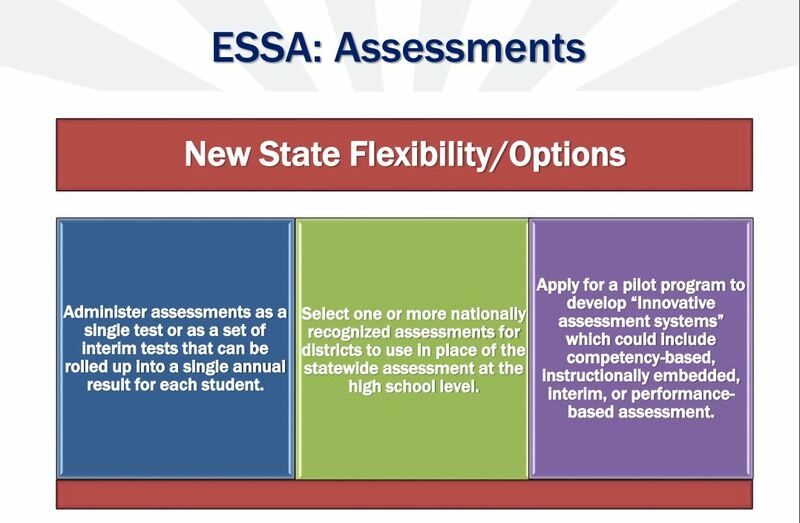 The new flexibility in assessment options aligns with recent state legislation – Senate Bill 1321 and House Bill 2544 – and ADE is looking at becoming one of the seven states that will take part in a pilot program to develop innovative assessment systems, Williams said. “We are interested in doing that and applying for this opportunity to actually develop innovative assessment systems,” Williams said. 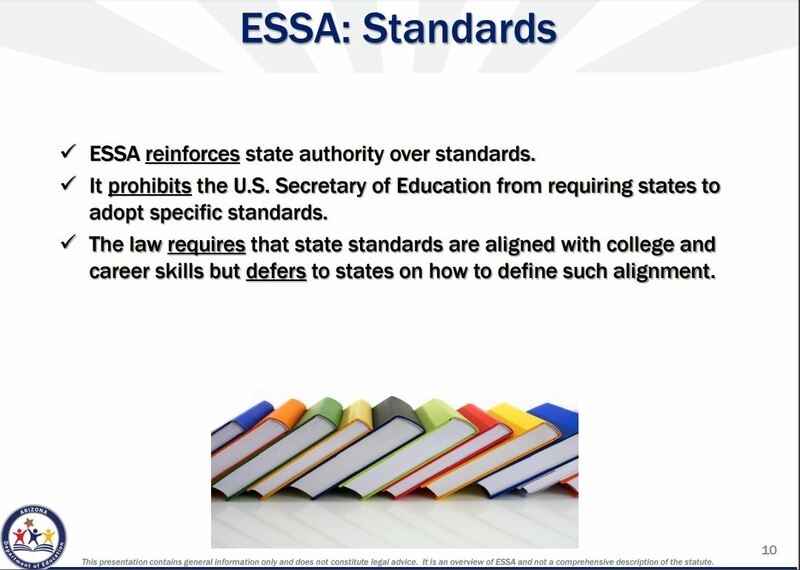 ESSA enforces the state’s authority over the standards and prohibits the U.S. Department of Education from requiring states to adopt any particular standards, Williams said. “It allows states to do the work they think is most important related to standards and developing those that are most important to their states,” Williams said. 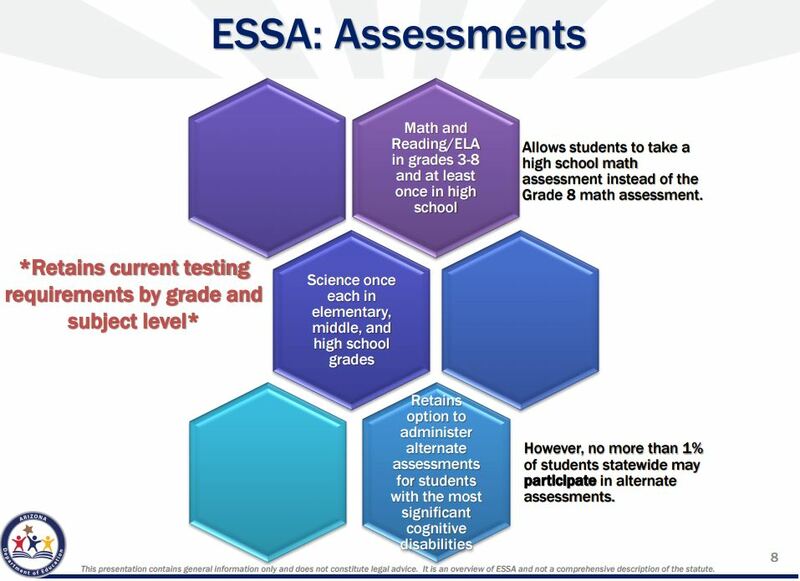 ESSA no longer requires a specific measurement in their teacher evaluation system, instead it puts more emphasis on multiple measures of observation,” said Mark McCall, ADE deputy associate superintendent for highly effective teachers and leaders. In addition, schools will be able to use their federal Title II funds – for teacher professional development, evaluation and certification – in more flexible ways, McCall said. 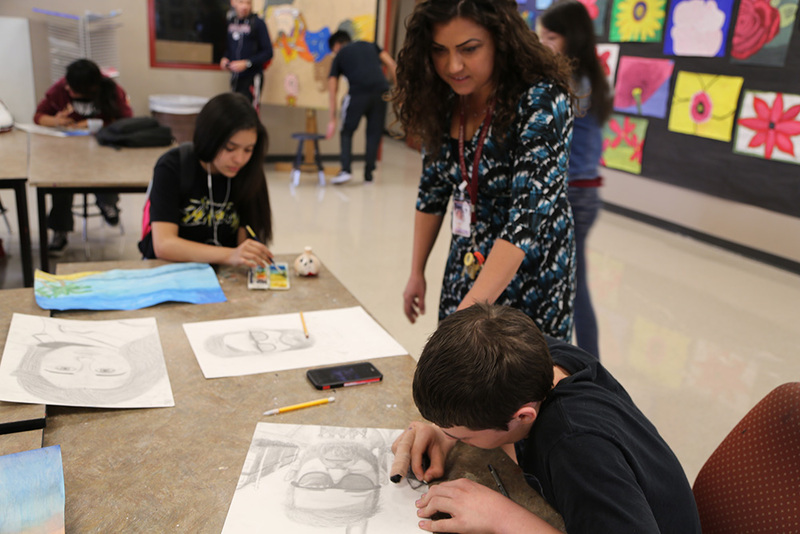 Also, applications are available for the fifth and final federal Teacher Incentive Fund grant from the U.S. Department of Education, which will “be connected back to teacher and leader effectiveness and to our state’s equity plan,” McCall said. 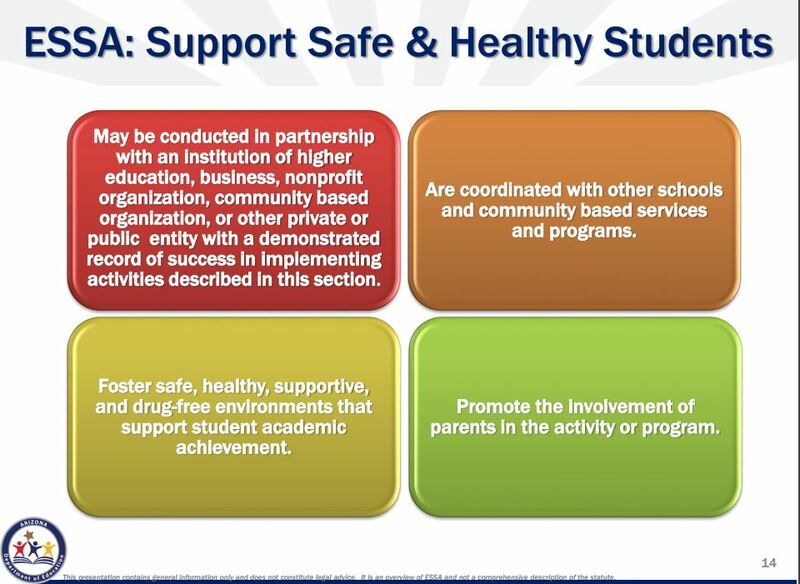 Also, ESSA now allows for the use of federal Title IV funds for student safety and health programs and activities that are essential “when we’re looking at the whole school, whole community, whole child model,” said Nerissa Emers, ADE director of clinical school health. “When you’re incorporating these programs and activities you will have a lot of choices and resources provided to you, but we want them to be evidence-based programs that have shown success when it comes to students’ safety and health,” Emers said. As Arizona’s education plan is developed and revised in the next several months, there will be more information available for students, educators, parents, business leaders and community members and more news coverage. 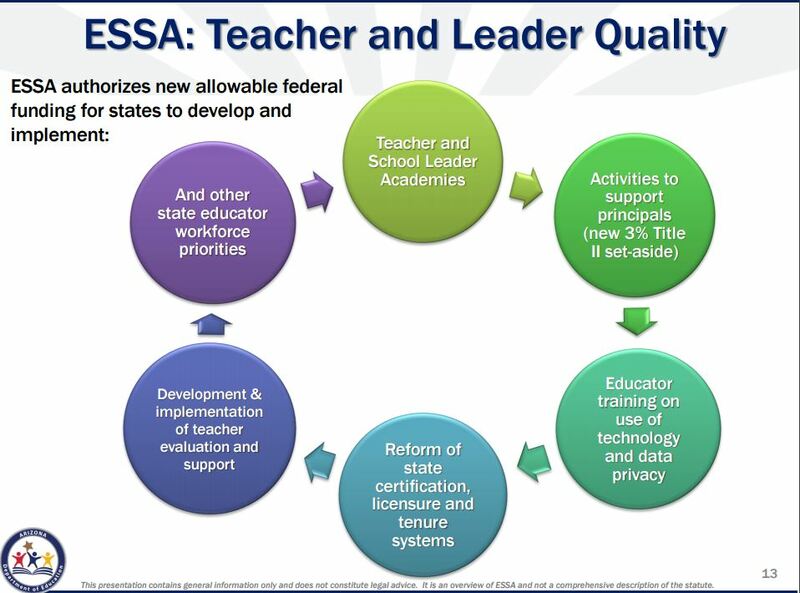 To find out more about ESSA and let education leaders know what’s important to include in Arizona’s plan to improve the quality of education, please look at the Arizona Department of Education’s ESSA website at www.azed.gov/essa/. 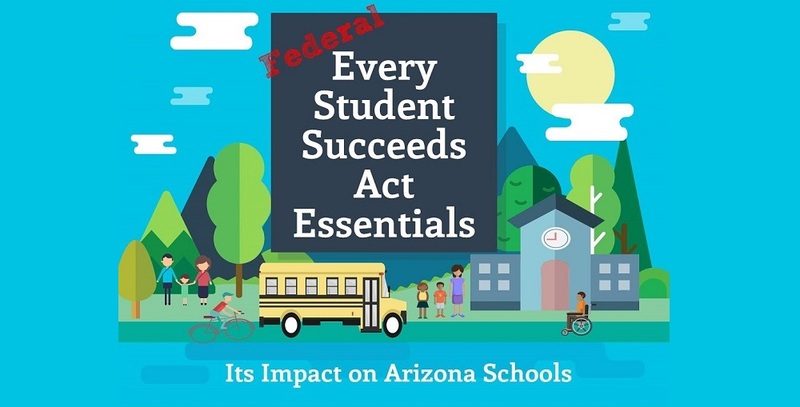 If you are interested in receiving regular ESSA updates from Arizona Department of Education, you can sign up at www.azed.gov/essa/essa-updates/. What would it take to raise Arizona teachers’ salaries?